While Kamala and Bruno contemplate the truth behind her powers and the identity of the lookalike she saw in the time stream, Ms. Marvel #36 takes its audience on a time traveling they’ll never forget. 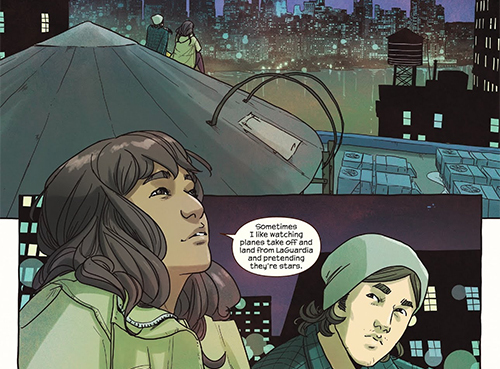 Plot: Ms. Marvel #36 starts off with a perhaps accidental allusion to “Airplanes” by B.o.B. and Hayley Williams, but it works perfectly when watching the Jersey City night sky with one’s best friend. Especially when that night sky quickly gives way to a trip into the past, introducing audiences to Lady Kamilah and Sir Brunello of 1257 AD, traveling along the Silk Road to make their fortune. It is a pleasant enough trip, considering no one bathed back then, until they come upon a battle fought with swords that look suspiciously like lightsabers. One of the men in the fight seems to be none other than Kamala’s Inhuman ancestor, Brunello and his friend Sir joshua are quick to join the fray, but they are protected from harm by the Inhuman’s powers. His name is Farak, and soon enough he and Kamilah fall in love. 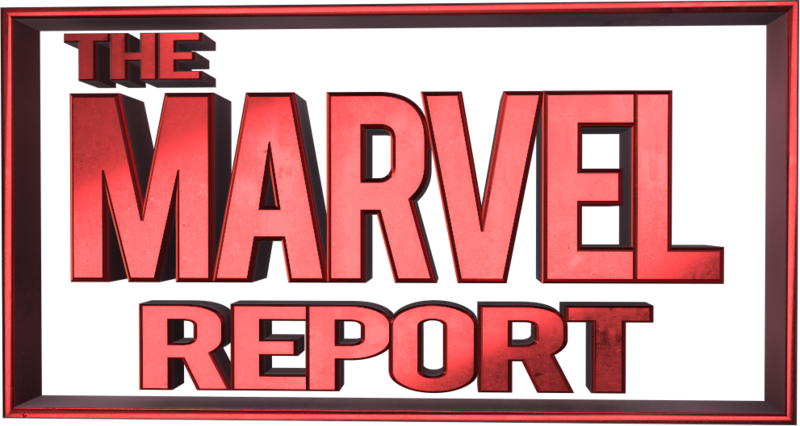 Story: Ms. Marvel #36 questions the nature of time, and whether it is linear or cyclical, while giving readers a small break from the action of the last few issues. While nothing much happens, per se, it is an excellent way to process the meaning behind Kamala’s powers and how they work. 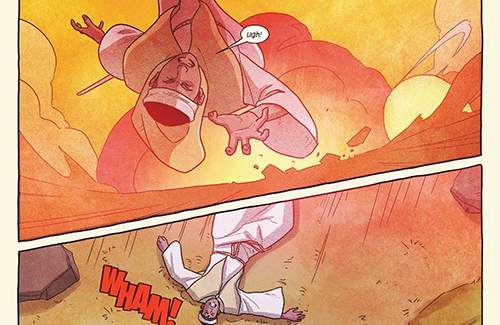 Furthermore, the blast from the past that G. Willow Wilson incorporates is lovingly told. The same signature mix of humor, such as the 13th century Lady Zoë who will only do something heroic if absolutely necessary, and heart that has defined the Ms. Marvel series so far is applied in a different manner with some interesting results. Outside of the story itself, which is a very fun look at what Kamala and Bruno might have been doing if they lived in Iran in the 1200s, there is a metatextual importance to the time traveling surrounding it. 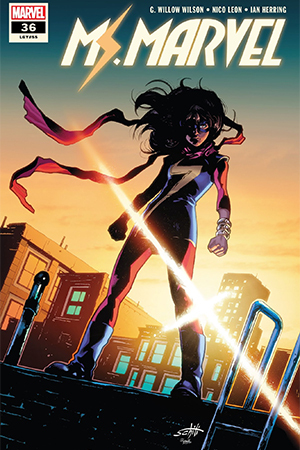 It’s the first detailed theory that’s been developed about Kamala’s powers, stemming from the previous issues’ adventures, but Ms. Marvel #36 quickly veers from hard science to the emotions and themes that the series has always been about. Bravery, and love for family and humanity alike define every aspect of Kamala, so it’s only natural that they would define her ancestors as well. Furthermore, there’s a sense that Kamala and Bruno may be creating this story with their theories rather than it being a straightforward declaration of facts. After all, Bruno suggests that they keep living the same lives over and over again only for Wilson to present four incredibly familiar characters, even pointing out that Brunello is pining for Kamilah, just as one would expect. Then Kamala expresses her belief that perhaps two people just fell in love and started a family that led to her, without any explosions or galactic battles, which is exactly what we see happening on the page. Perhaps they are just attuned to the space-time continuum after metaphorically traveling it themselves, or perhaps the truth can’t be uncovered but only hinted at. Either way, it makes for a lovely and compelling issue that in anyone else’s hands might have come across as pure filler. Art: The artwork in Ms. Marvel #36 certainly contributes to its quality, from the gorgeous opening shot of Kamala and Bruno staring up at the stars to the final shot of Kamala’s ancestors heading into the great unknown together. Nico Leon handles the character designs beautifully as usual and draws out the subtle emotions in every Kamala-Bruno interaction. One can almost imagine their conversation playing out in real time thanks to the understated visuals. Ian Herring’s colors are top-notch as well, the deep blues and purples of nighttime in the present contrasting perfectly with the warm orange and yellows of daytime in the past. That distinction, in addition to the very believable 13th century costumes, helps to make the events of yesteryear feel like more than a copy of the dynamics between Kamala and her friends today. There’s even a little bit of action midway through the issue, and the artwork flows naturally from stillness to motion and back again. It’s certainly one of the most beautiful Marvel comics in recent months. Verdict: Ms. Marvel #36 mat not provide a villain as fun as Shocker or a fight sequence as intense, but it does an excellent job of checking in with its protagonist and painting a picture of her family history even as it surreptitiously explores Bruno’s feelings for her. It’s unclear where the story goes from here, but we’ll be armed with both the scientific and emotional components of Kamala’s powers in preparation for wherever it takes us.